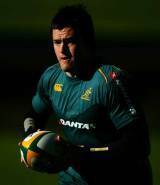 Versatile Australian back Adam Ashley-Cooper has made himself an integral part of the Wallaby set-up under Robbie Deans, although his utility status has not disappeared with experience. Having won international caps at centre, wing and fullback, Ashley-Cooper has proven his worth but not dominated a position. Nevertheless, the Brumbies back has become a regular fixture in Australian squads, including the 2009 Tri-Nations where his greater experience saw him edge out teenage sensation James O'Connor for the opener against the All Blacks at Eden Park. He was handed a development contract with the Brumbies in 2004, making his Super Rugby debut in 2005 against the Crusaders. His gametime was limited by injury, but he did enough to impress international selectors, making his Test debut from the bench against South Africa during the 2005 Tri-Nations. Ashley-Cooper nailed down a regular berth in the Wallaby starting line-up in 2007, playing in all seven winter fixtures and scoring a fine try against the All Blacks. In March 2011 Ashley-Cooper announced that he would be leaving the Brumbies at the end of the Super Rugby season after agreeing a two-year contract with the Waratahs. Despite a mixed season for the Brumbies, Ashley-Cooper kept his place in the Wallabies side forming a new centre combination with Pat McCabe. Ashley-Cooper was used in the centres, on the wing and at fullback during the 2011 World Cup and managed to score five tries in the process. Going into the 2012 Super Rugby season, he was shifted around by the Waratahs as they endured a disappointing campaign.